at 8:30 AM walking down in the village to the little supermarket. Bread, butter and milk, cheese, eggs, baccon, juice, coffee, sugar, flower, liquid washing, water bottles and vin and, and, and .... Here you find anythings. I collect together any needs and visit the butcher in the back for fresh meet. There is always time for a small talk to Bene, the shop owner. She will deliver my things in her break at 2 PM at home, that's the normal service on Gozo. Next I step in by Michael's for fresh fruits and vegetables. The bells on St. Joseph beats 10 AM and a break by Zeppi's is a to do! I meet friends and get news about village and events. 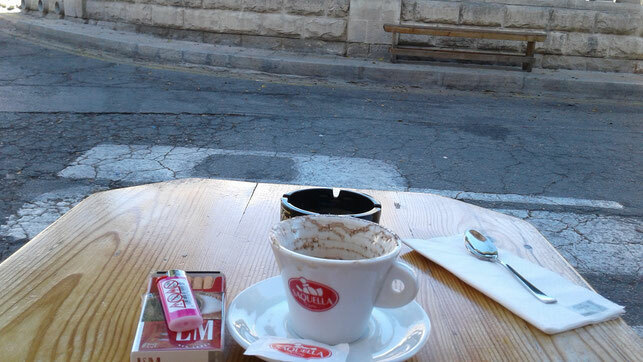 A cool water and nice cappuccino and I'm ready to move on my little hill! Back at home I go in the pool again - what a fun to have it!!! After clean up the living room, kitchen and pool area, I visit my sunbed in the shadow for relaxing. The guests are on the way and will stand in front of the door at 3 PM. Before I sleep in, the bell rings and Bene is there with the delivery - excellent! Preparing coffee and put the dishes and biscuits on the desk at the pool - I'm ready for welcome. The guys from Estonia arrive just in time. A young couple from the north is happy about a cool water and cup of coffee, meanwile I tell about the house and the tools for use. I recognize the boy doesn't understood English and the girl has problems by translation- mhm, this will be a funny conservation next days. I show them the places to use und bring they up to the guestroom. Now my job is done and it's 4:30 PM. Relaxing is my to do now. Staying at/in the pool, watching TV and waiting for the night by a glas of wine - cheers!